Lucy, your book, Moon Time, is monumental. I cannot tell you how long I have thought of the very things you are putting forward and to see this in print is thrilling. I am in tears with this birth of your work that is so important for women. Lucy, what you are doing is a great service for women. Your book joins the momentum of changing the paradigms and shifting what will come. Thank you for growing this consciousness as I see that our futures will be anchored with Red Tents for decades to come because we co-created a world where women honor themselves. For our daughters and their mothers, thank you. This book is a wonderful journey of discovery. Lucy not only guides us through the wisdom inherent in our wombs, our cycles and our hearts, but also encourages us to share, express, celebrate and enjoy what it means to be female! A beautiful and inspiring book full of practical information and ideas. Lucy Pearce weaves a moon-web that draws in the many other women who have written on the subject of menstrual cycles and places herself as one, amongst others. Her open and accessible book offers practical, often humorous ideas and encouragement about how we can tune into our own cycles and dance with them in the most creative and healthy way. She offers her own experiences as a real-life example with warts and all of what the terrain might be like. Lucy reminds us of the things we seem to have forgotten about. She is one of the special whisperers, who helps us to remember our own power and sacredness as played out in our cycles. Through her writing she initiates a dialogue with her readers. She says what she has to say, and then asks us What do you think? Her writing empowers her readers to have a voice to respond. This is a remarkable gift to us. This book came to me like a gift from heaven and it opened my eyes… I have always thought about menstruation as a heavy weight, a curse on women, but after reading this book I learnt something new about myself and felt in peace with my body. Now i cherish my body and the changes it experiences in every moon cycle, I am more aware of the physical and emotional changes in me and therefore i can organize my life and make the best of it. I truly recommend this book to women, and why not, to men who would like to understand the changes of the female body in a more holistic way. Thank you Lucy for sharing this knowledge with us. An interesting book also arrived this week – Moon Time by Lucy Pearce takes a look at the menstrual cycle and explores ways in which we can celebrate each part of the process from ovulation through to our blood time. 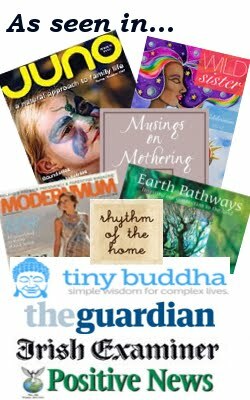 There are some great ideas for tuning into the body and a wealth of heartwarming information that I needed to read on the Crazy Woman time of the month! Lucy’s book is a warm and friendly invitation to look at our womanly rhythms and make friends with all the different phases we go through in the context of our monthly cycle and equally, at the various different stages of our womanhood. By embarking on a journey of greater understanding of ourselves, of how we think and behave at different times of the month or the different ages of womanhood, we are able to nurture ourselves and each other more appropriately. This book will not eliminate cramps or crabbiness, or other period related problems, but it will help us to think more closely about how we can jiggle our commitments around so we can plan for quiet, nurturing, introspective time and outgoing, busy periods to coincide with our monthly clock. How hard we work to make that possible is up to us. Like all great teachers, she simply shows a path, which the reader can take as far as they want…. and by reminding us of our connection to the moon, to ancient rhythms, we can find a more peaceful way of embracing our many different phases, not just at ‘Moon Time’. A wonderful, open-hearted book, that fills in the gaps about being a woman, and has already helped me to make sense of what’s going on in my body and mind throughout the month. It deserves to be widely read, and it’s wisdom to become accepted as common knowledge for all women of the future. The power for us of just knowing ourselves is immense and wonderful. It is the start of a paradigm shift in the place of women in our western culture. I just want to tell you that your book Moon Time has been so important to my new mother life, that I carry it in my purse wherever I go since I have read it. My mother language is Spanish, and that book is my portable oasis where I can rest my soul even if I am surrounded of a crowd. Not many people in my country, Mexico, talks or read in English, so I can have moments alone with me and your writing as my baby sleeps her naps, while relatives or people at work think I am reading poetry about the night and the moon . My baby is going to be 9 months old this next Friday and I have felt so weird, so not me, so in the sea since the second month of pregnancy that I thought I was sincerely becoming crazy. My pregnancy was mentally so challenging as nothing was before in my life. Your book gave the me the answer I was looking for since then. At The Crazy Woman part I have finally founded the key of what was happened to me at that long earthquake that was for me my pregnancy. When I was reading it I was both smiling and with tears in my eyes…I felt so grateful to you, to your wisdom and for sharing all that knowledge that felt like a piece of wood thrown to one that have shipwrecked. From my bed with my baby sleeping in my side, in the middle of the night, I’ve sent you all my gratitude for helping me bring back hope, calm, understanding of myself, and a new sense of complicity to myself, to my wild woman side. No one have told me that she existed even if our ancient goddesses are at museums, feeling her crazy, screaming inside me with so much pain along my pregnancy was so scary that I couldn’t sleep for months. She has make me learn so much from me that I will never forget that period of my life, and this new life I landed without parachute. But having you naming her, sharing ideas of how to live with her, bringing me back to my sanity and to trust me again.